A Canadian carrier called WIND Mobile, via its Facebook page, decided it was the perfect time to post up a pre-registration page for the Nexus 5. Sure, the device has yet to be announced by Google or LG, but they are going for it anyways. 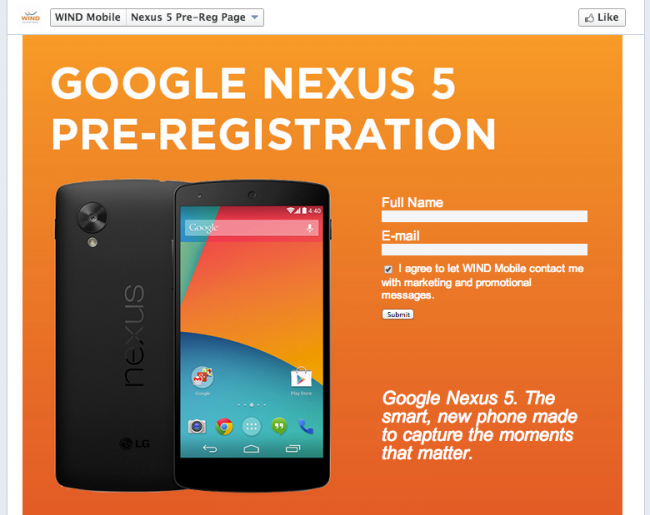 Not only are folks asked to sign up to be notified when the device goes up for sale, but they also posted the Nexus 5’s full technical specifications and dimensions. That’s nice of them. According to WIND, the Nexus 5 will feature all of the specs we have seen rumored for a while now. It has the Snapdragon 800 processor, 4.95″ 1920 x 1080 display, 2GB of RAM, an 8MP back-facing camera with OIS technology onboard, and of course, Android 4.4. Included along with the specs are the dimensions, coming in at 69.17 x 137.84 x 8.59 mm. Full list is below. Naturally, it appears that the registration page has been pulled for the time being. Canada has been an excellent source of Nexus 5 info today, especially with these alleged snapshots of a warehouse room full of N5s. We know, this situation is now officially out of control, and we hope Google will just go ahead and announce it already.